A savory and sweet winter galette perfect for holiday parties or Thanksgiving dinner. Baked apples mingle with butternut squash for a delicious and healthy meal, all wrapped in a flaky sage crust. 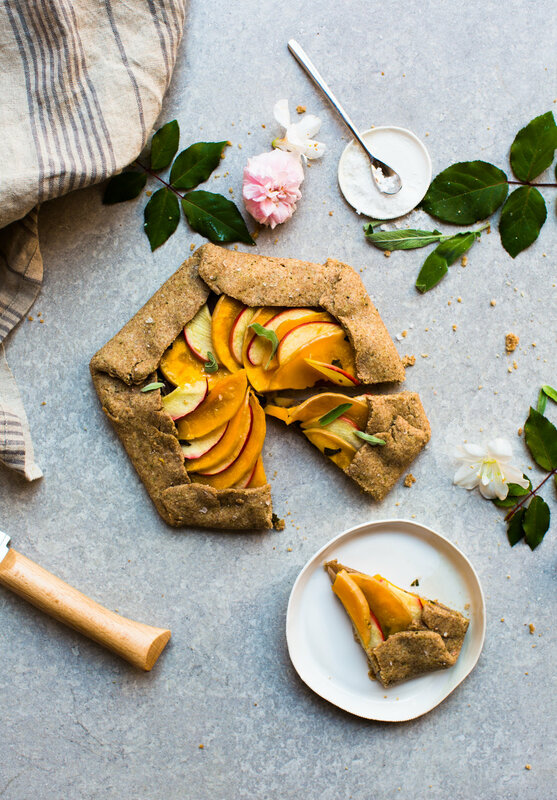 So here you have it - a savory galette that has just a touch of sweetness coming from the beautifully roasted apple slices (like how I managed to sneak a note of sweet in here too ;). And I want to thank you for pushing me to make a savory tart, a first for me. I honestly couldn't contain myself over on IG when I finally shared a photo of this with you. Beneath the layers of roasted squash and apple slices are sautéed onions, all wrapped in a sage freckled crust. It’s absolutely heavenly. It's also synch to whip together, and might I add, quite the perfect little appetizer to serve during holiday parities or Thanksgiving dinner. Either way, I hope this beauty finds its way to your table soon. Start by preheating your oven to 350F. Now make the crust by adding the flour, sea salt and sage leaves into the food processor. Slowly add in the coconut oil and water, and pulse frequently as this gently blends into the flour. Pulse only enough until the the ingredients combine together, 30 seconds or so. Now fold the dough into a ball and let it rest in the fridge for 30 minutes to 1 hour. In the meantime, make the filling. In a small pan on medium-high heat, warm the olive oil. Add in the onions, pinch of salt, one teaspoon of sage leaves, and sauté for about 5 minutes. Set this aside as you roll out your dough into a circle, about 1/4 inch thick. Add a drizzle of olive oil to the center of the crust, layer on the onions evenly in the center and leave about a 1 inch rim from the center of the galette to the edge (this will be the crust that you fold over the veggies). Mix the squash and apples in a small bowl with a drizzle of olive oil and sea salt. Then add the butternut squash and apple slices on top of the onions (just as you see it in the picture below). Gently fold the edges of the crust on top of the outer sides of the squash. Add small chunks of the coconut oil on top of the galette, along with the sage leaves, and bake in the oven for 20-25 minutes, or until the curst is flaky and the squash is cooked through. Slice and enjoy!